Interested in learning about what green infrastructure is, why it’s important, and how you can help your neighborhood and your city by starting a green infrastructure project where you live? Start here! Pittsburgh is about to make the largest public investment in its history. Like hundreds of cities across the country, the Pittsburgh Region’s sanitary authority, ALCOSAN is under a consent decree with the Environmental Protection Agency (EPA) because it is not in compliance with the Clean Water Act, meaning that when it rains, raw sewage from the city’s overburdened sewer system over flows and pollutes the area’s rivers. ALCOSAN is under a mandate from the EPA to fix the problem, which gives Pittsburgh a tremendous opportunity to make real, long lasting changes. The Clean Rivers Campaign is leading the way. 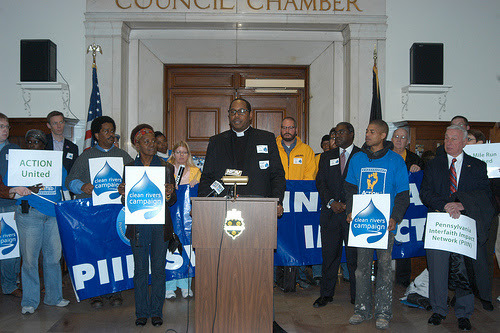 This coalition of organizations led by Pittsburgh UNITED and including Clean Water Action and Action United was launched as an advocacy and education campaign almost three years ago that was tasked with informing ordinary people and elected officials about the opportunity to create a sustainable and vibrant Pittsburgh by investing in green infrastructure to repair the City’s sewer system. 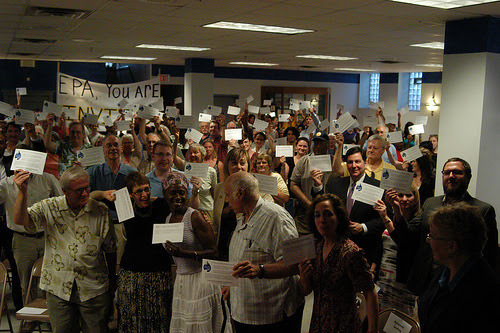 Together, the partner organizations knocked on more than 40,000 doors, hosted speaker series on the benefits of green solutions, and met with elected officials from Pittsburgh and from other municipalities across the region to discuss how investing in green solutions can bring economic, social, and environmental benefits to cities and the people who live there. Using green solutions means investing in infrastructure that uses natural processes to manage stormwater. There are a whole array of strategies to help absorb water into the ground rather than having it run straight into the sewer system, such as rain gardens, bioswales, properly maintained and planted trees, permeable pavements, and green roofs. However, few cities have water management systems that use these techniques. Tom Hoffman, the Western Pennsylvania Director at Clean Water Action, explained that when it rains in Pittsburgh currently the water runs off of the roofs, the parking lots and the streets and the sidewalks and it goes into storm sewers. “Unfortunately, like many cities our ‘storm sewers’ and our ‘sewers sewers’ are the same thing,” meaning that storm water runoff ultimately flows into the same sewers used for raw sewage. This is called a Combined Sewer System (CSS). During heavy rainfalls, the amount of water in the CSS exceeds the system’s capacity, and is ultimately discharged directly into rivers, spilling raw sewage into natural water bodies to relieve overburdened sewers. Green infrastructure offers a more sustainable and environmentally friendly alternative. One of the most vocal advocates for these types of solutions in the City of Pittsburgh has been Pittsburgh Mayor Bill Peduto. When the EPA ruled that ALCOSAN’s current plan to fix the sewer system using gray infrastructure was deficient, Alvarado explained that Mayor Peduto responded passionately about the city’s opportunity to use green infrastructure for the City’s sewer fix. Mayors want the best for their cities, which makes green infrastructure investments an even more positive choice since the benefits go beyond just the environment. Because the sewer repair will be funded by ratepayer increases, it is important that local people can see improvements in their communities. Green solutions will produce more green spaces in communities, increase property values and decrease crime, as well as create good jobs. Being at the forefront of cities making a green-first sewer fix isn’t always easy. While there is research from around the country, Pittsburgh needs more local data to demonstrate the kinds of impacts created by investments in green infrastructure. Using ioby, the Clean River Campaign has begun to generate the revenue to get the local data they need to show the sanitary authority that green solutions are really a cost effective way of maximizing benefits. Alvarado explained, “The technical analysis resulting from this study will show the potential for green infrastructure, paired with right sized gray infrastructure to address our region’s water quality problems. The study will provide a data-driven, technical framework to assist the region’s decision makers, in making informed decisions about this infrastructure investment.” They can continue to conduct this important research with your support. 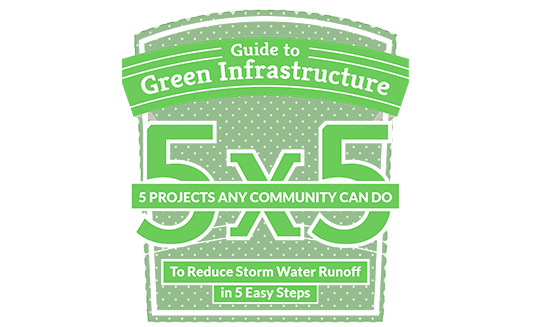 Today, ioby is proud to release our Guide to Green Infrastructure, 5 Projects that any Community Can Do to Reduce Storm Water Runoff in 5 Easy Steps. You can can download this free guide by clicking here. This guide is released as a resource for ioby leaders applying to qualify for the green infrastructure matching funds, also announced today here. The Guide to Green Infrastructure was written collaboratively by ioby leaders and experts in the field. We are grateful to Robyn Mace, Devona Sharpe, Irene Nielson, Eric Rosewell and Philip Silva for sharing their expertise with all of us. This resource includes an easy how-to guide on creating a rain garden, a bioswale, installing a rain barrel, depaving and caring for street trees. We hope you enjoy it! Please share it widely, and if you want to send us feedback, please do so at feedback@ioby.org.